July is the month of summer vacations and getting ready to go back to school. Isn’t it amazing that while sitting by the pool you, the educator, will suddenly be thinking of all the things that need to be accomplished in the next 6 weeks before school starts back up? In the middle of all this, and taking into consideration budget cuts for schools, your mind wonders what alternative ways there might be to raise funds for your school. Let Cartridge World Bloomingdale help with a few suggestions for fundraisers. Some people cringe at the idea of a fundraiser because after all the work put in, they are left to wonder if they really did raise enough money to offset what was put out in time and energy. Cartridge World Bloomingdale has a few suggestions that really do help to make for a stress-free fundraiser, while helping the environment at the same time. 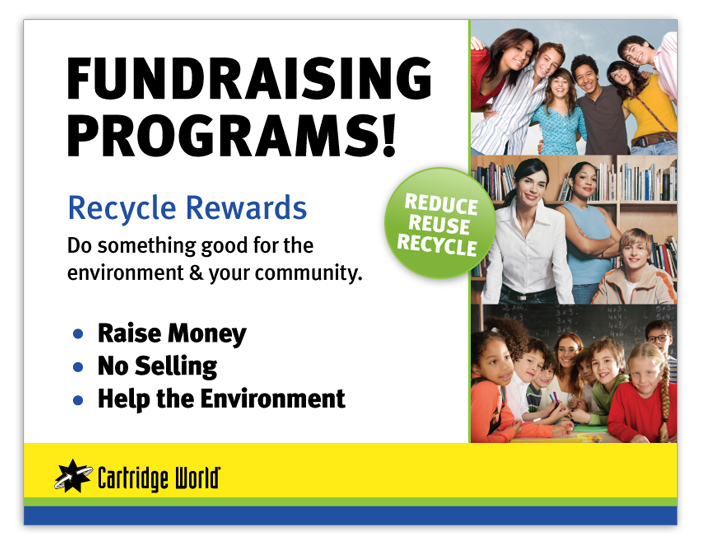 Re-Cycle Rewards – This fundraiser’s objective is to collect used printer cartridges to be recycled. We will provide you with Cartridge World recycle bins or boxes and promotional material. You simply put up the posters, and pass out the flyers. Cartridge World will pick them up the collected printer cartridges and write your school a check. Re-Fill Rewards – The objective of this fundraiser is to refill the printer cartridges you use at Cartridge World. Have friends and family come into Cartridge World to get their printer cartridges refilled and let us know which school you are sponsoring. Cartridge World will send the money their way. Don’t forget we also offer a 10% discount to all faculty and staff at the local schools for the printing needs. Just show a valid school ID at the time of purchase and we will give you the discount. Remember you only have six more weeks of summer vacation, so let Cartridge World Bloomingdale remove one of you back-to-school worries. Let us help you with your fundraisers. Call us at 630-893-6300, or visit our website to check it out. Feel free to contact Dominick Dauphin directly at 708-955-0174 with any questions you may have. Cartridge World in Bloomingdale, Illinois is a locally owned and operated ink and toner refill center. We guarantee all of our work and offer free delivery. On average, consumers, businesses and institutions save 1/3 or more when they Go Green and refill their cartridges. This entry was posted in Fundraisers and tagged (630) 893-6300, Army Trail Road, back to school, Bloomingdale, Cartridge World, Fundraisers, help maintain extracurricular programs, help the environment, Illinois, PTA, PTO, Recycle, Schools, summer. Bookmark the permalink.